Please activate desktop in the foreground at click feature, and it does not matter whether it is Windows 10 or Windows 8.1 or Windows 7 it works! With this function, although there are also extremely many windows, one can reach with the selected option, for example mouse right-click, that all windows are minimized and one has a clean view on the desktop. All windows are located in the Windows taskbar. 1.) ... Activate the "Desktop in the foreground" function! 2.) ... Tip: if there are too many windows on the desktop! 1.) Activate the "Desktop in the foreground" function! (Image-1) Bring Desktop to the foreground at click on Windows-10! 2.) Tip: if there are too many windows on the desktop! 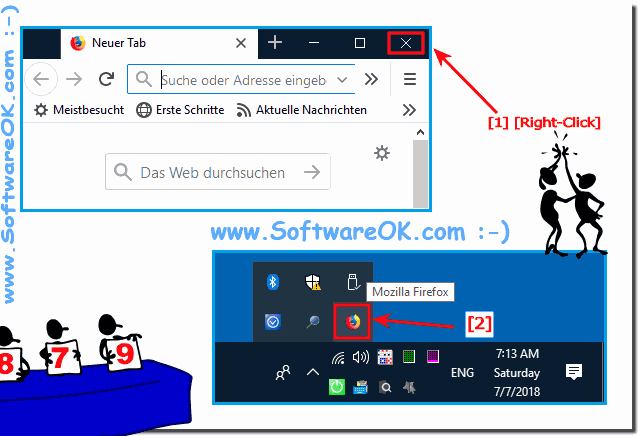 If you want all other Windows to be minimized via mouse right-click in the information area of ​​the Windows taskbar, enable this option in Desktop OK! If you click on the [X] Close a "Right Click" will run the Windows window, it will land in the info area of ​​the MS Windows taskbar! In this case FireFox! To restore from Firefox, simply click (click) on the icon in the info area! (Image-2) Firefox in Windows ToTray and restore in the desktop foreground at click! DesktopOK - FAQ-24: Windows desktop in the foreground at click doesn't work? New utility suggestion: the desktop should be activated and brought to the foreground when any part of it is clicked. This is same behavior of program windows, but for some reason does not work for the desktop. ?